There is also a zipfile of all the code examples. Writing correct code is complicated, it’s hard. How do you know when you’ve gotten it right, and how do you know your code has stayed right even after you’ve changed it? The best we know to do this is with automated testing. Testing is a large topic, with its own tools and techniques. It can be overwhelming. 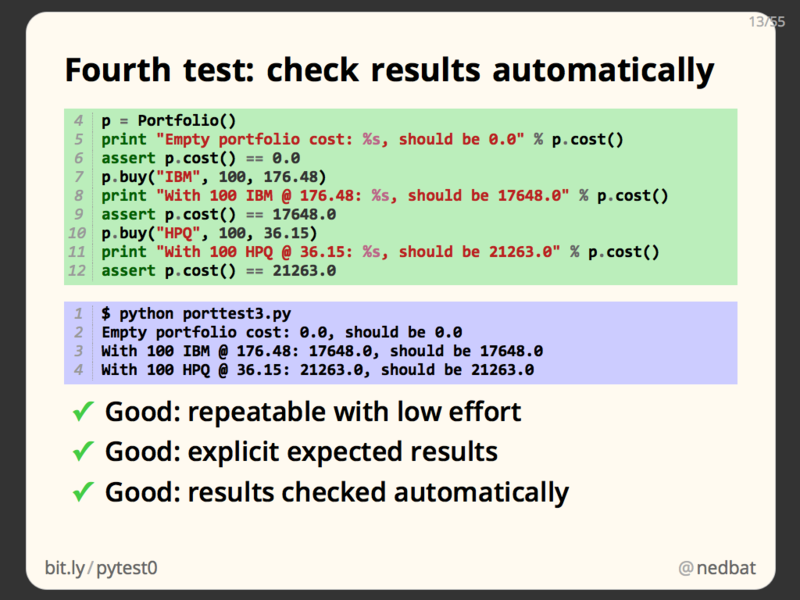 In this talk, I will show you how to write automated tests to test your Python code. I’ll start from scratch. By the time we’re done here, you should have a mystery-free view of the basics and even a few advanced techniques, of automated testing. I’ll include some pointers off to more advanced or exotic techniques, but you will have a good set of tools if you follow the methods shown here. The concepts covered here work the same in Python 2 or 3, though the code is Python 2. In Python 3, a few imports and module names would have to change. My main point here isn’t to convince you to test, I hope you are reading this because you already know you want to do it. But I have to say at least a little bit about why you should test. Automated testing is the best way we know to determine if your code works. There are other techniques, like manual testing, or shipping it to customers and waiting for complaints, but automated testing works much better than those ways. Although writing tests is serious effort that takes real time, in the long run it will let you produce software faster because it makes your development process more predictable, and you’ll spend less time fighting expensive fires. 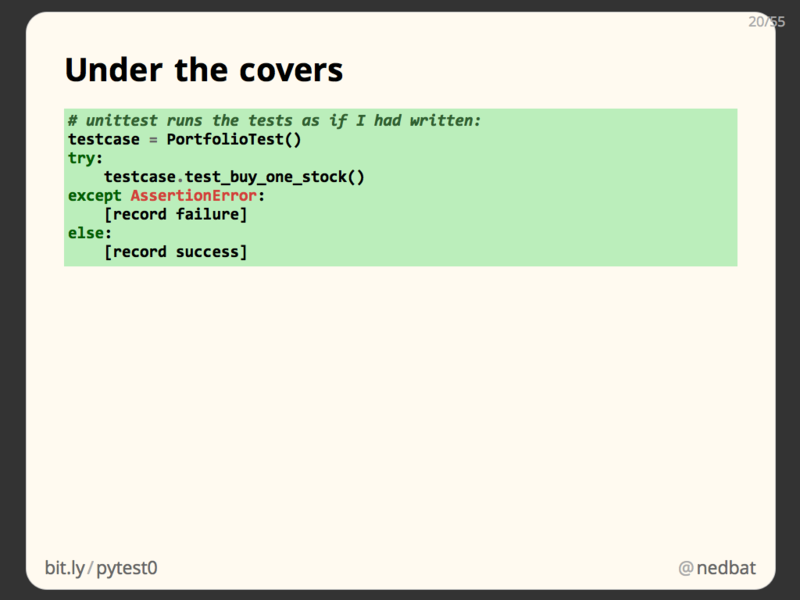 Testing also gives you another view into your code, and will probably help you write just plain better code. 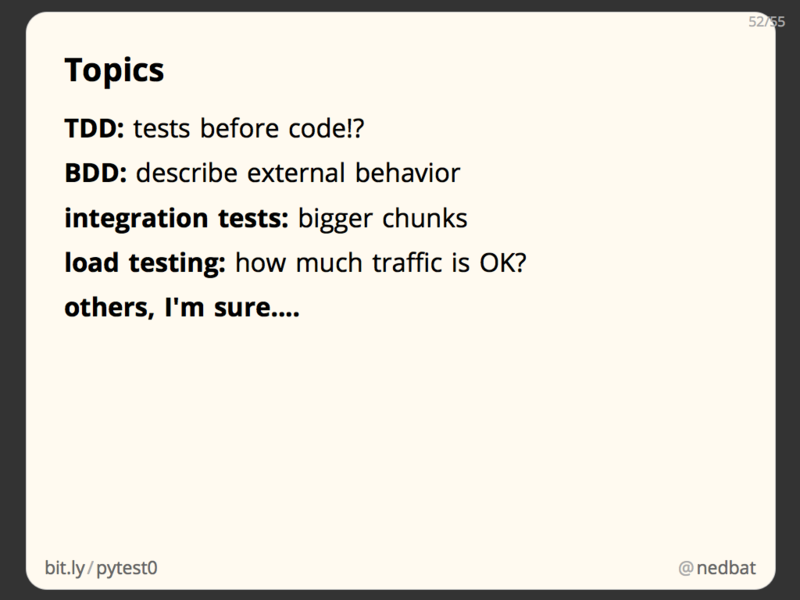 The tests force you to think about the structure of your code, and you will find better ways to modularize it. Lastly, testing removes fear, because your tests are a safety net that can tell you early when you have made a mistake and set you back on the right path. 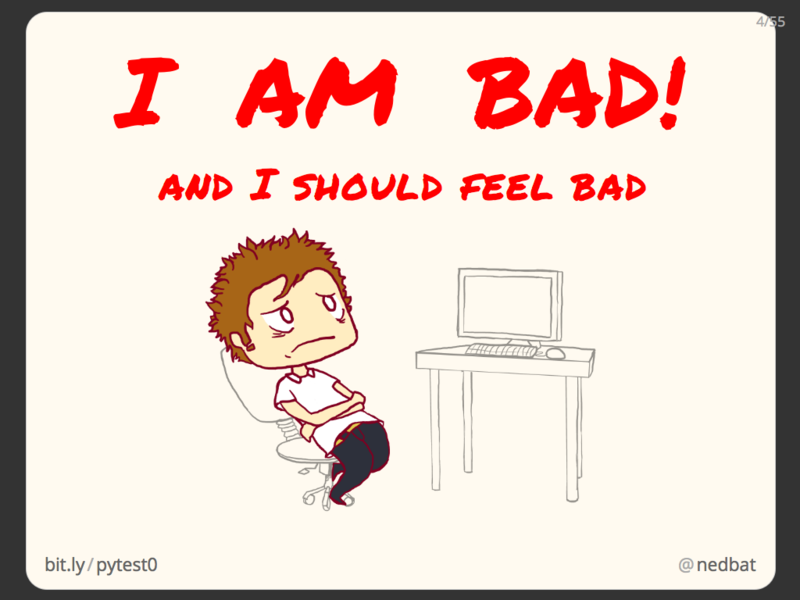 If you are like most developers, you know that you should be writing tests, but you aren’t, and you feel bad about it. Tests are the dental floss of development: everyone knows they should do it more, but they don’t, and they feel guilty about it. BTW: illustrations by my son Ben! It’s true, testing is not easy. It’s real engineering that takes real thought and hard work. But it pays off in the end. 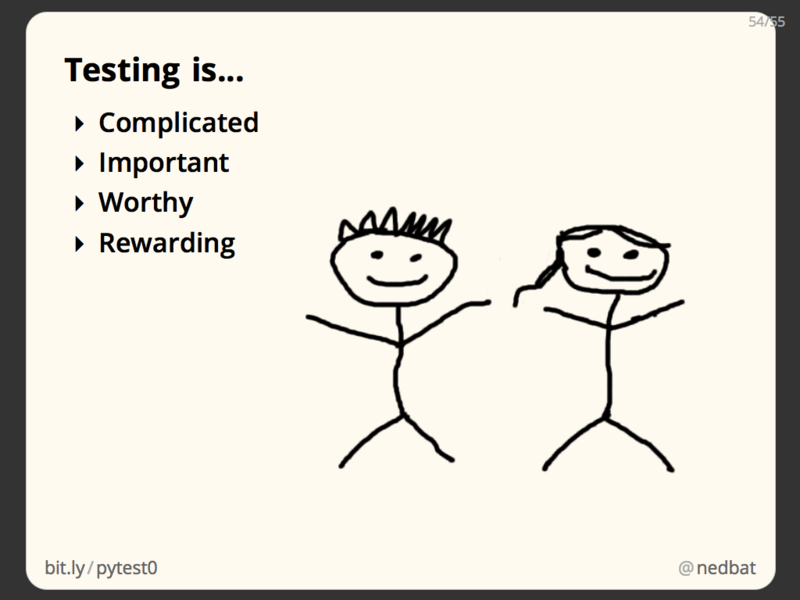 How often have you heard someone say, “I wrote a lot of tests, but it wasn’t worth it, so I deleted them.” They don’t. Tests are good. The fact is that developing software is a constant battle against chaos, in all sorts of little ways. You carefully organize your ideas in lines of code, but things change. You add extra lines later, and they don’t quite work as you want. New components are added to the system and your previous assumptions are invalidated. The services you depended on shift subtly. You know the feeling: on a bad day, it seems like everything is out to get you, the world is populated by gremlins and monsters, and they are all trying to get at your code. 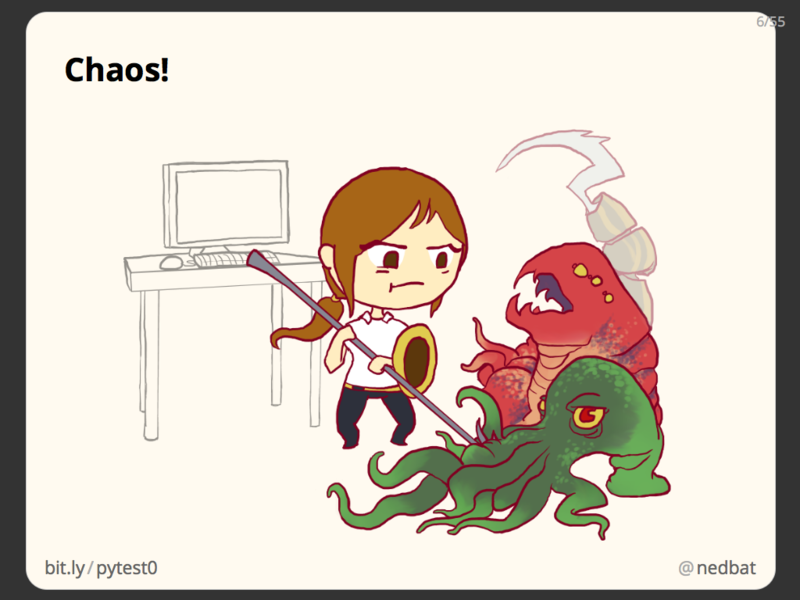 You have to fight that chaos, and the weapon you have is automated tests. OK, enough of the sermon, let’s talk about how to write tests. 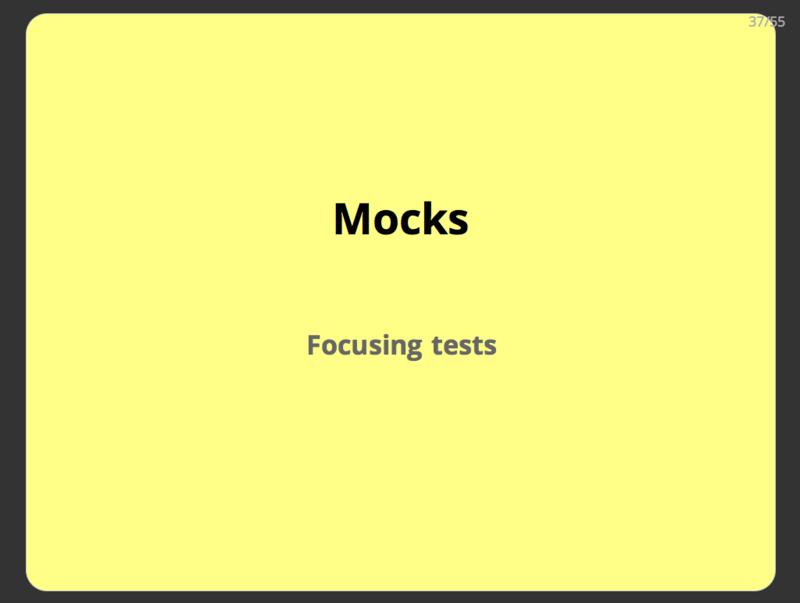 and we’ll talk about a more advanced topic, mocks. We’ll start with a real (if tiny) piece of code, and start testing it. 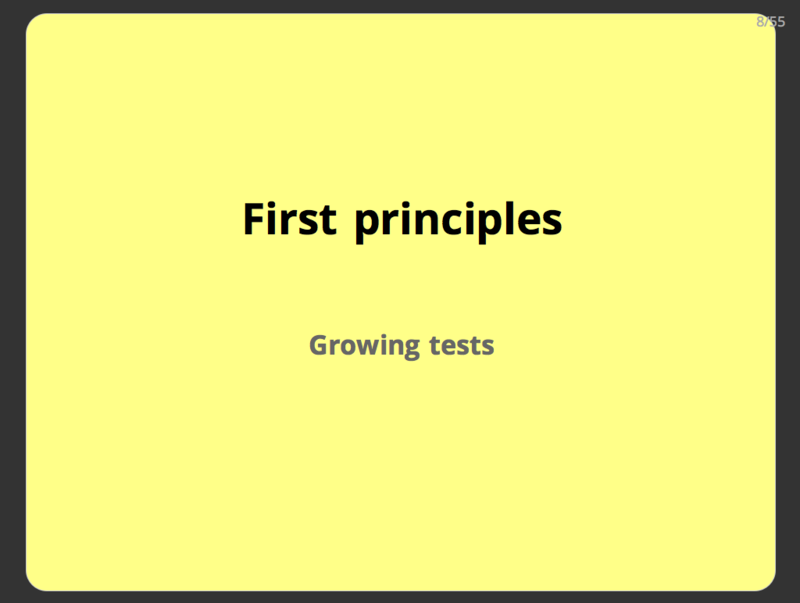 First we’ll do it manually, and then grow in sophistication from there, adding to our tests to solve problems we see along the way. Keep in mind, the first few iterations of these tests are not the good way to write tests. I’ll let you know when we’ve gotten to the right way! """Buy `name`: `shares` shares at `price`.""" """What was the total cost of this portfolio?""" For our first test, we just run it manually in a Python prompt. This is where most programmers start with testing: play around with the code and see if it works. Running it like this, we can see that it’s right. An empty portfolio has a cost of zero. We buy one stock, and the cost is the price times the shares. Then we buy another, and the cost has gone up as it should. This is good, we’re testing the code. Some developers wouldn’t have even taken this step! But it’s bad because it’s not repeatable. If tomorrow we make a change to this code, it’s hard to make sure that we’ll run the same tests and cover the same conditions that we did today. It’s also labor intensive: we have to type these function calls each time we want to test the class. And how do we know the results are right? We have to carefully examine the output, and get out a calculator, and see that the answer is what we expect. So we have one good quality, and three bad ones. Let’s improve the situation. This is better because it’s repeatable, since we can run this test file any time we want and have the same tests run every time. And it’s low effort: running a file is easy and quick. But we still don’t know for sure that the answers are right unless we peer at the numbers printed and work out each time what they are supposed to be. But we still have to examine all the output and compare the actual result to the expected result. Keep in mind, the code here is very small, so it doesn’t seem like a burden. But in a real system, you might have thousands of tests. You don’t want to examine each one to see if the result is correct. This is still tedious work we have to do, we should get the computer to do it for us. So now we have the results checked automatically. If one of the results is incorrect, the assert statement will raise an exception. Assertions like these are at the heart of automated testing, and you’ll see a lot of them in real tests, though as we’ll see, they take slightly different forms. We can only see a single failure, then the rest of the program is skipped, and we don’t know the results of the rest of the tests. This limits the amount of information our tests can give us. As you can see, we’re starting to build up a real program here. To make the output hide successes, and continue on in the face of failures, you’ll have to create a way to divide this test file into chunks, and run the chunks so that if one fails, others will still run. It starts to get complicated. Anyone writing tests will face these problems, and common problems can often be solved with standard libraries. 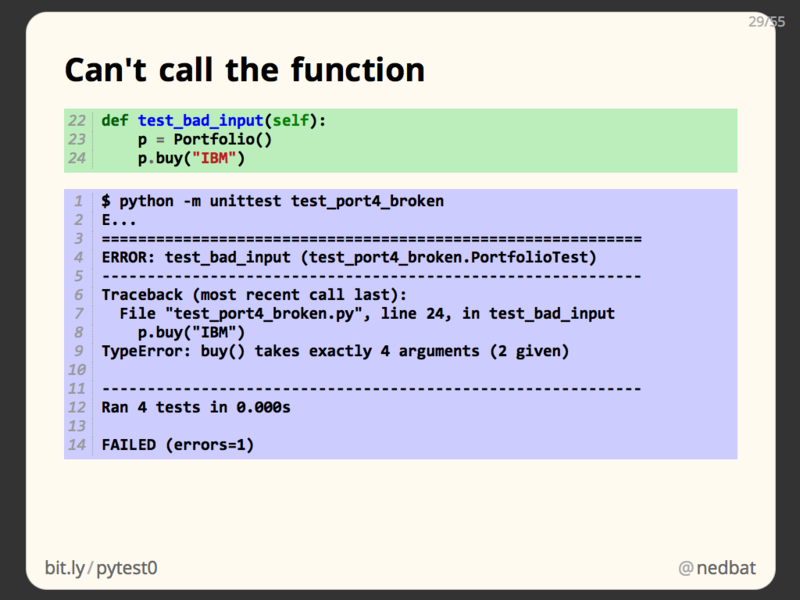 In the next section, we’ll use unittest, from the Python standard library, to solve our common problems. 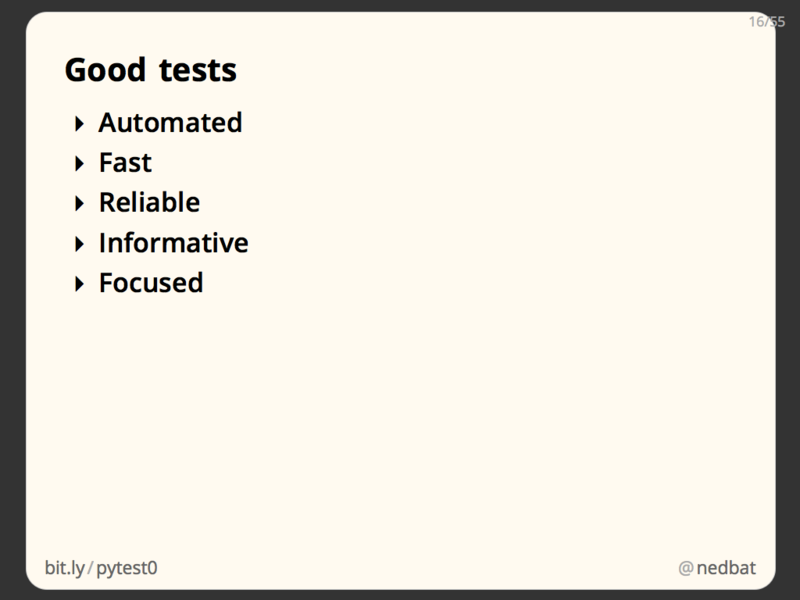 Before we look at unittest, let’s talk for a minute about what qualities make for good tests. 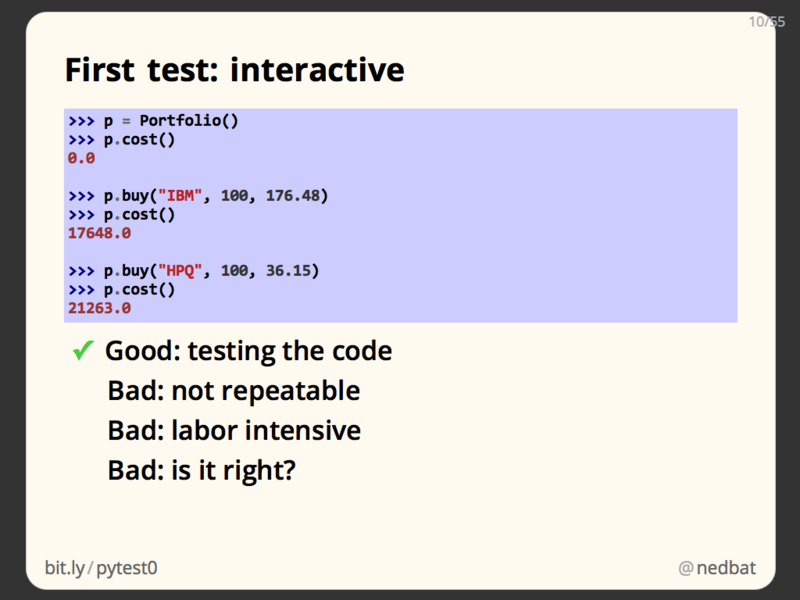 The whole point of a test is to tell you something about your code: does it work? They are no use to us if they are a burden to run, so we need them to be automated, and they need to be fast. Tests have to be reliable so that we can use them to guide us. If tests are flaky, or we don’t believe their results, then they could give us false results. That would lead us on wild goose chases. The world is chaotic enough, we don’t want to add to it by writing tests that pose more questions than they answer. To be reliable, tests must be repeatable, and they must be authoritative. We have to believe what they tell us. What they tell us must be informative. Think about your workflow when running tests: if the test pass, you go on to write more features, or you go outside and enjoy the sunshine. But what happens when they fail? Then you have to find out what is wrong with your product code so you can fix it. The more the test can tell you about the failure, the more useful they are to you. So we want our tests to be informative. We also want them to be focused: the less code tested by each test, the more that test tells us when it fails. The broken code must be in the code run by the test. The smaller that chunk of product code, the more you’ve already narrowed down the cause of the failure. So we want each test to test as little code as possible. This may seem surprising, often we’re looking for code we write to do as big a job as possible. In this case, we want each test to do as little as possible, because then when it fails, it will focus us in on a small section of product code to fix. 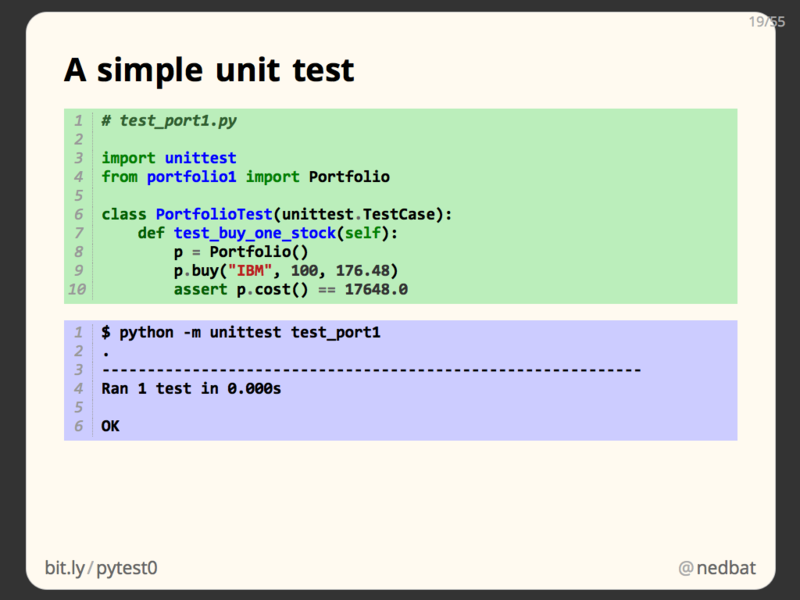 The Python standard library provides us the unittest module. It gives us the infrastructure for writing well-structured tests. 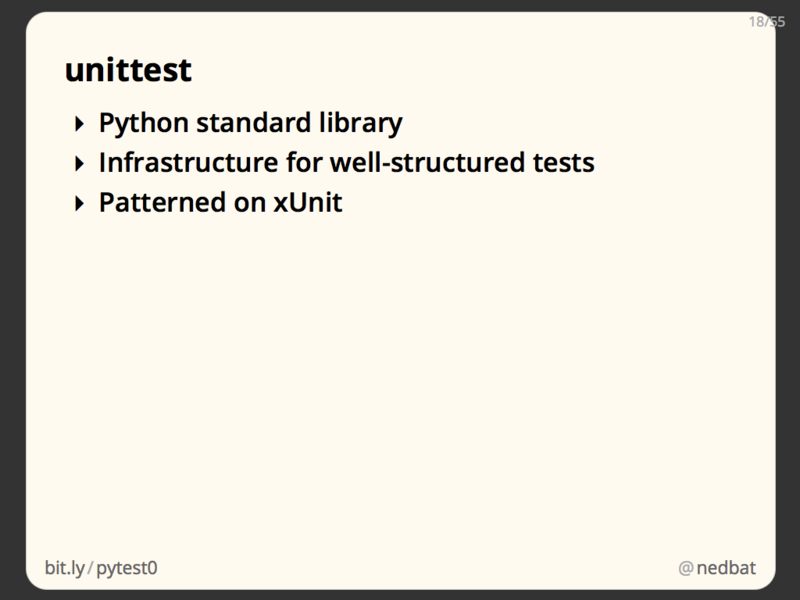 The design of unittest is modelled on the common xUnit pattern that is available in many different languages, notably jUnit for Java. This gives unittest a more verbose feeling than many Python libraries. 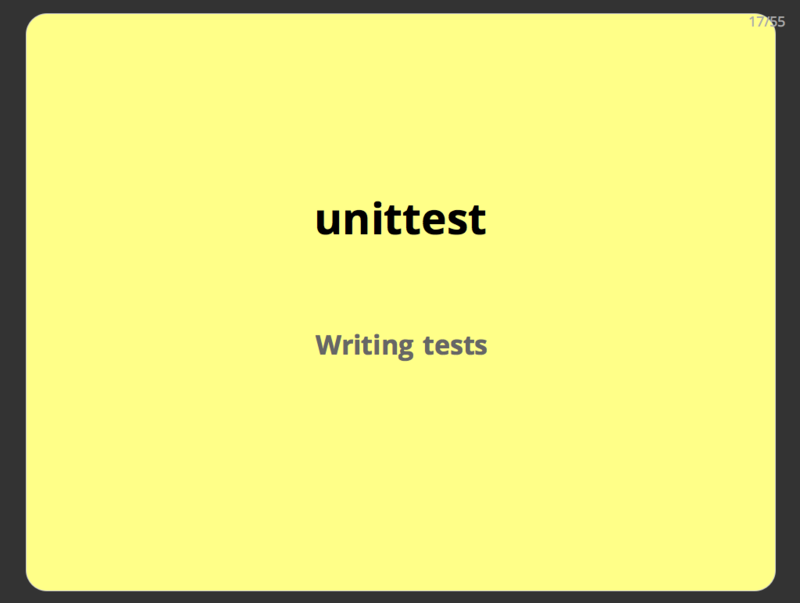 Some people don’t like this and prefer other styles of tests, but unittest is by far the most widely used library, and is well-supported by every test tool. There are alternatives to unittest, but it’s a good foundation to build on. I won’t be covering any alternatives in this talk. Let’s look at the structure of the test in detail. 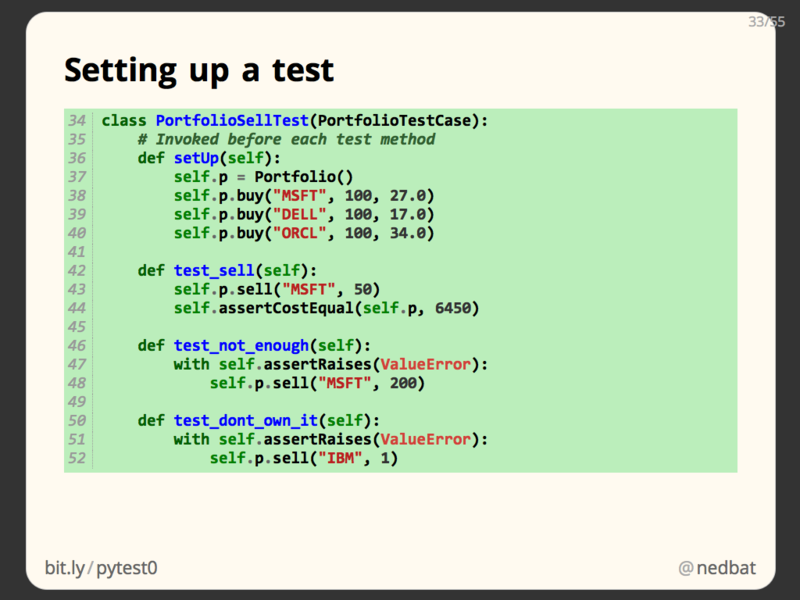 All tests are written as methods in a new class. The class is derived from unittest.TestCase, and usually has a name with the word Test in it. 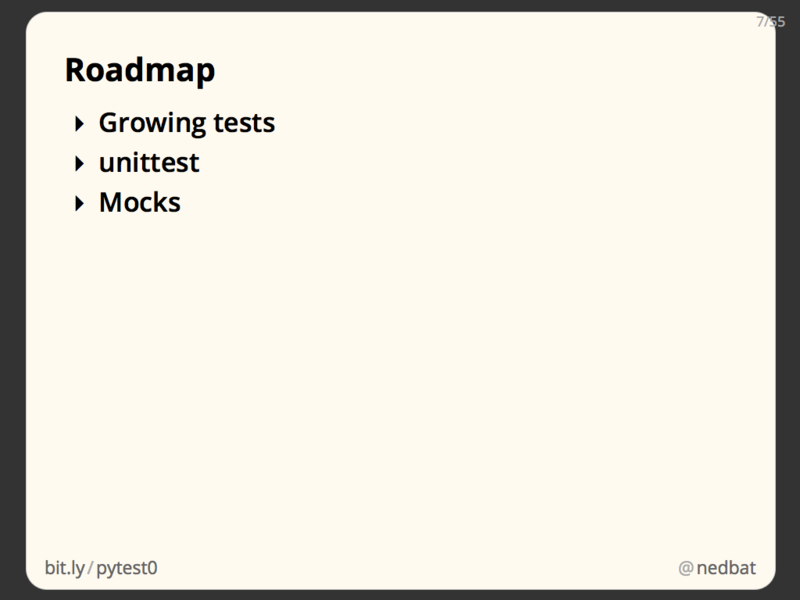 The test methods all must start with the word “test_”. Here we have only one, called “test_buy_one_stock”. The body of the method is the test itself. 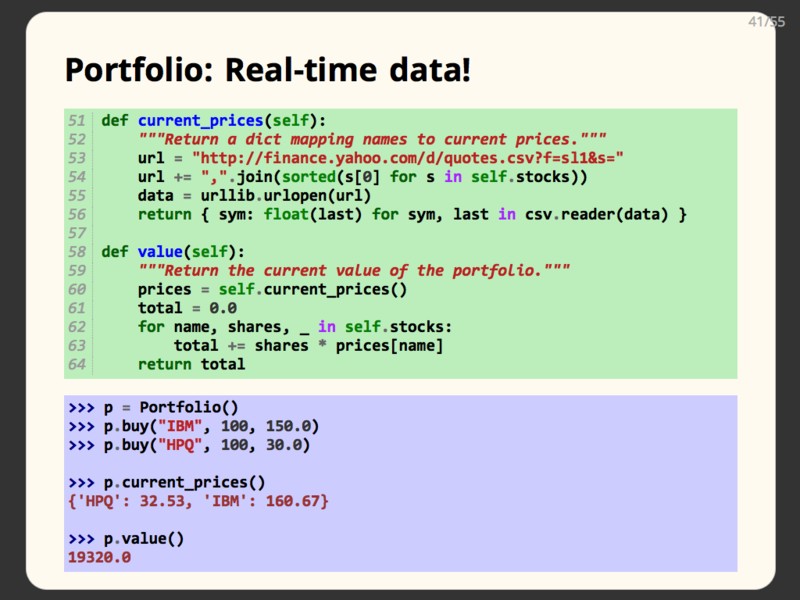 We create a Portfolio, buy 100 shares of IBM, and then make an assertion about the resulting cost. This is a complete test. To run it, we use the unittest module as a test runner. “python -m unittest” means, instead of running a Python program in a file, run the importable module “unittest” as the main program. The unittest module accepts a number of forms of command-line arguments telling it what to run. In this case we give it the module name “test_port1”. It will import that module, find the test classes and methods in it, and run them all. Our test code is organized a bit differently that you might have expected. To help understand why, this is what the test runner does to execute your tests. To run a test, unittest creates an instance of your test case class. Then it executes the test method on that object. 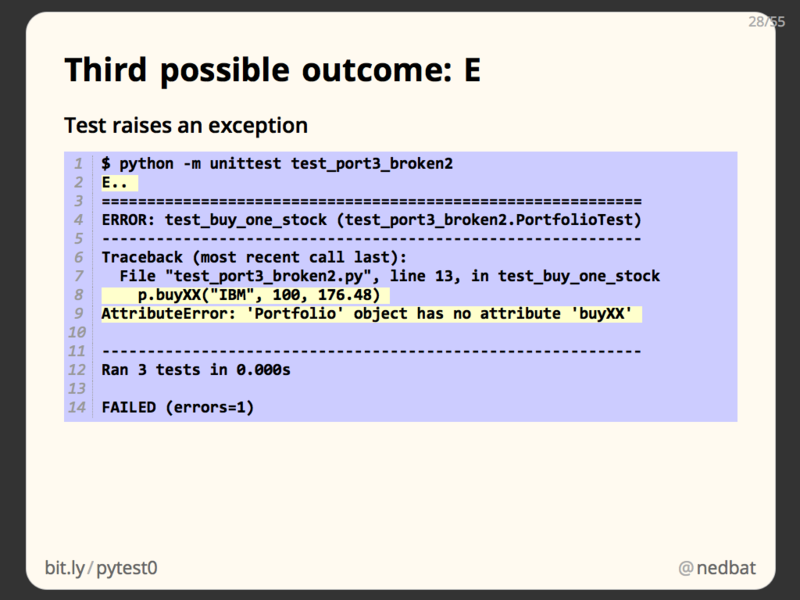 It wraps the execution in a try/except clause so that assertion failures will be recorded as test failures, and if no exception happens, it’s recorded as a succcess. Each one creates the portfolio object it needs, performs the manipulations it wants, and makes assertions about the outcome. With three tests, the execution model is much as before. 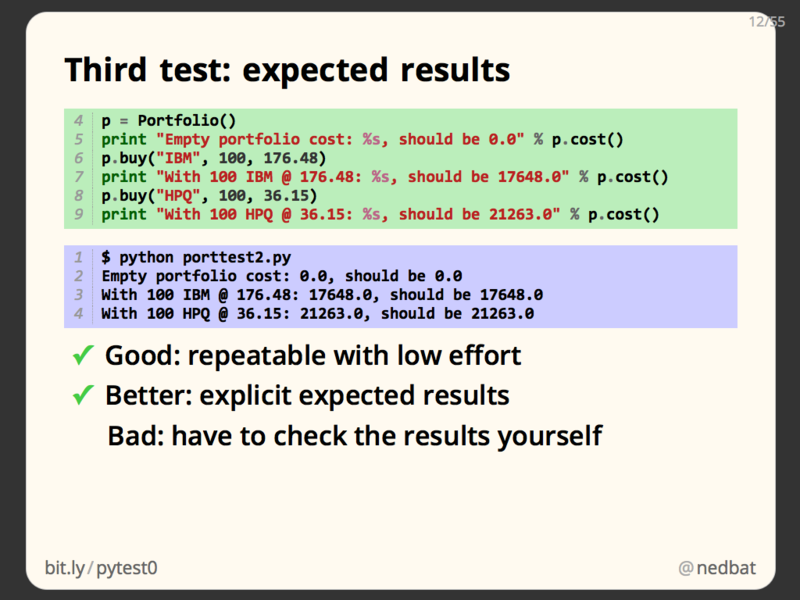 The key thing to note here is that a new instance of PortfolioTest is created for each test method. This helps to guarantee an important property of good tests: isolation. 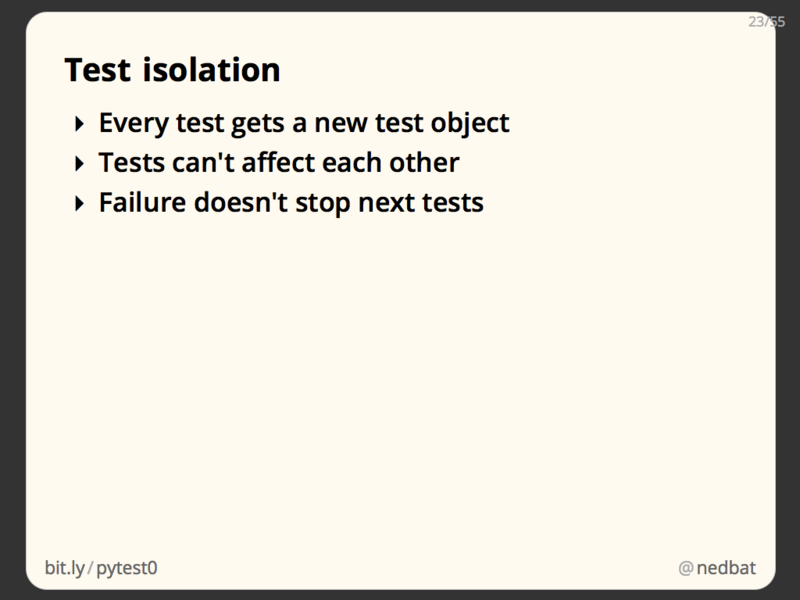 Test isolation means that each of your tests is unaffected by every other test. 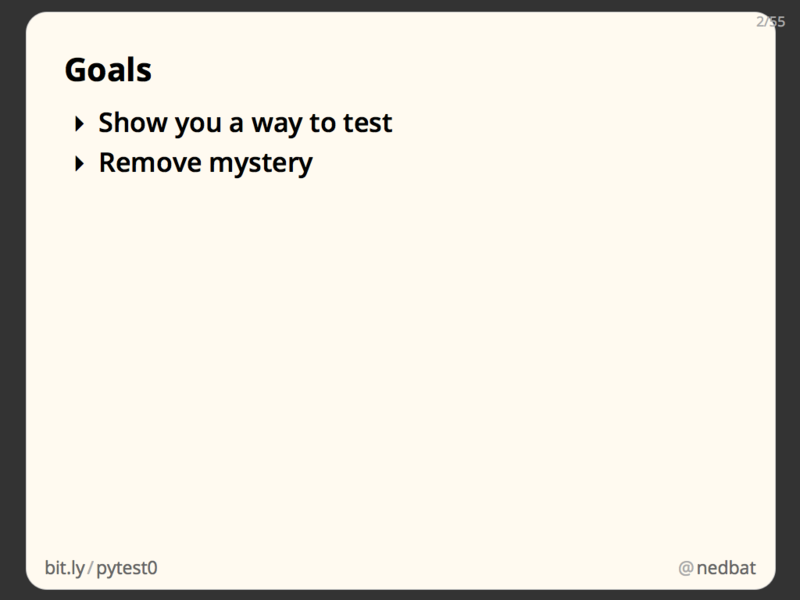 This is good because it makes your tests more repeatable, and they are clearer about what they are testing. It also means that if a test fails, you don’t have to think about all the conditions and data created by earlier tests: running just that one test will reproduce the failure. Earlier we had a problem where one test failing prevented the other tests from running. Here unittest is running each test independently, so if one fails, the rest will run, and will run just as if the earlier test had succeeded. So far, all of our tests have passed. What happens when they fail? The test runner prints a dot for every test that passes, and it prints an “F” for each test failure, so here we see “.F.” in the output. Then for each test failure, it prints the name of the test, and the traceback of the assertion failure. 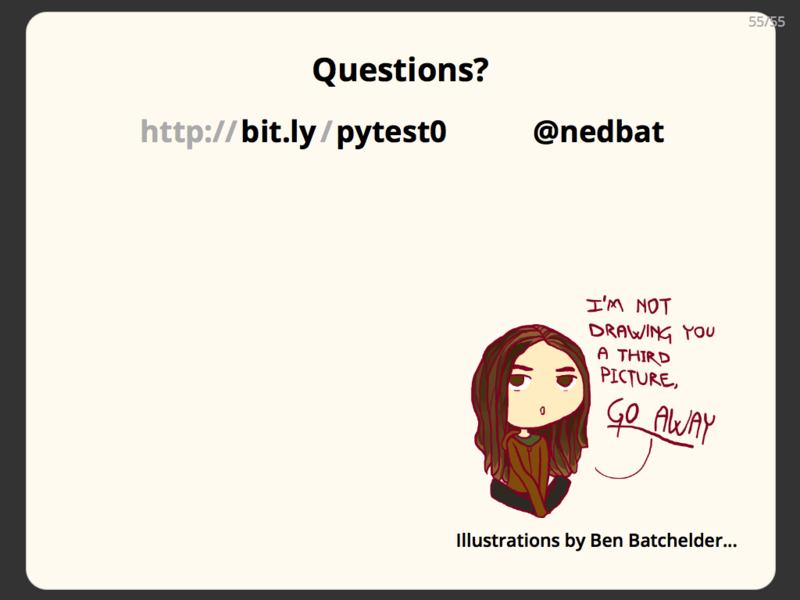 This style of test output means that test successes are very quiet, just a single dot. When a test fails, it stands out, and you can focus on them. Remember: when your tests pass, you don’t have to do anything, you can go on with other work, so passing tests, while a good thing, should not cause a lot of noise. It’s the failing tests we need to think about. It’s great that the traceback shows what assertion failed, but notice that it doesn’t tell us what bad value was returned. We can see that we expected it to be 17648.0, but we don’t know what the actual value was. 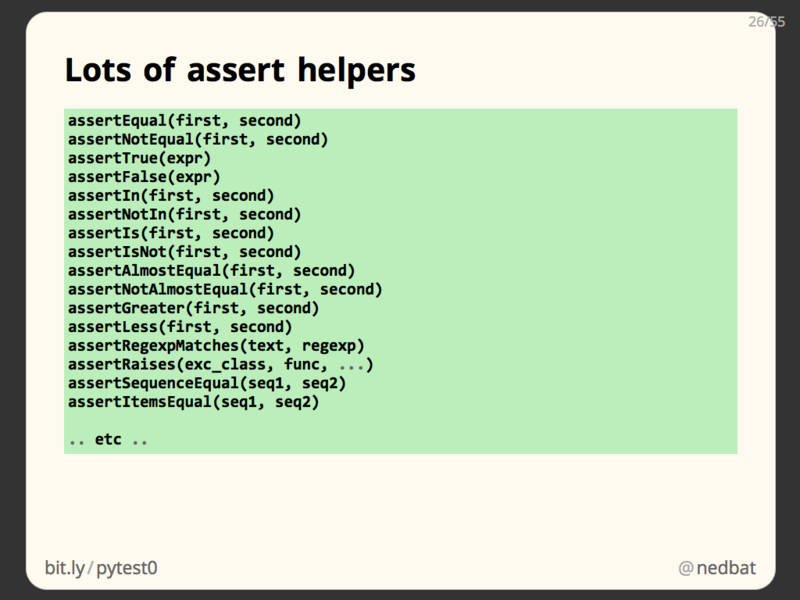 In this test, we’ve used self.assertEqual instead of the built-in assert statement. The benefit of the method is that it can print both the actual and expected values if the test fails. Here the assertion error message shows both values. 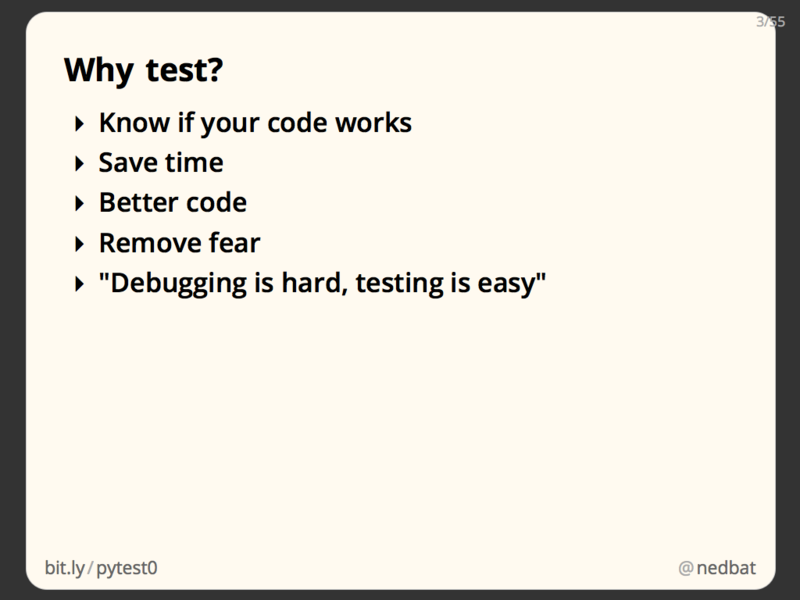 The best tests will give you information you can use to diagnose and debug the problem. Here, when comparing two values for equality, we are told not only that they are not equal, but also what each value was. 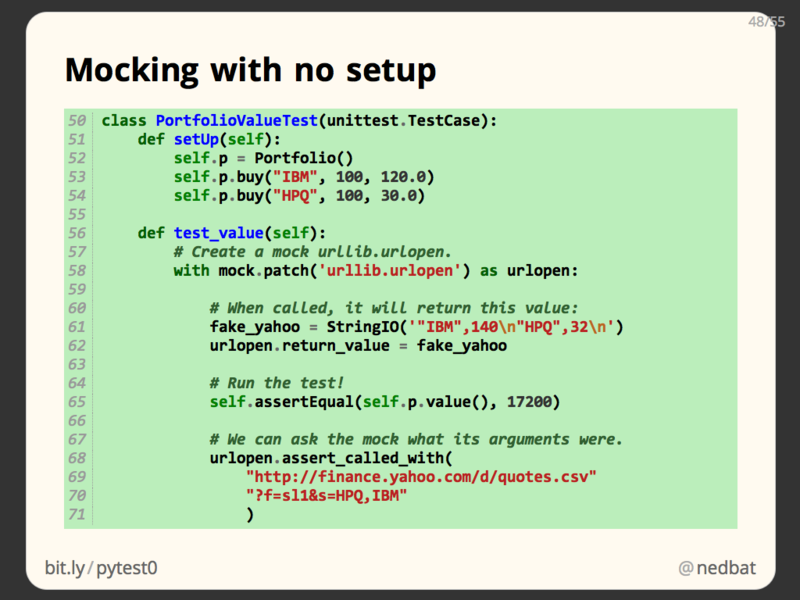 The unittest.TestCase class provides many assertion methods for testing many conditions. Read through the unittest documentation to familiarize yourself with the variety available. 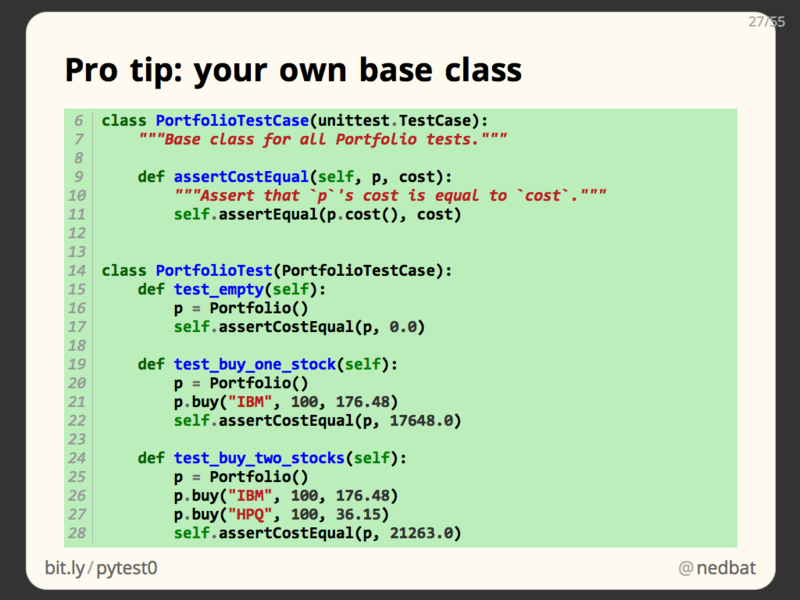 One simple thing you can do that will help as your test code grows, is to define your own base class for your test classes. You derive a new test case class from unittest.TestCase, and then derive all your test classes from that class. """Base class for all Portfolio tests.""" """Assert that `p`'s cost is equal to `cost`.""" This class only has a single new method, and that method is pretty simple, but we’re only testing a small product in this code. Your real system will likely have plenty of opportunities to define domain-specific helpers that can make your tests more concise and more readable. In this case, the mistake is in the test: we tried to call a method that doesn’t exist. That’s not good, we want all our tests to pass. Now our test passes because the TypeError is caught by the assertRaises context manager. The assertion passes because the exception raised is the same type we claimed it would be, and all is well. If you have experience with unittest before 2.7, the context manager style is new, and much more convenient than the old way. Note: this code is very simple, for the purpose of fitting on a slide! 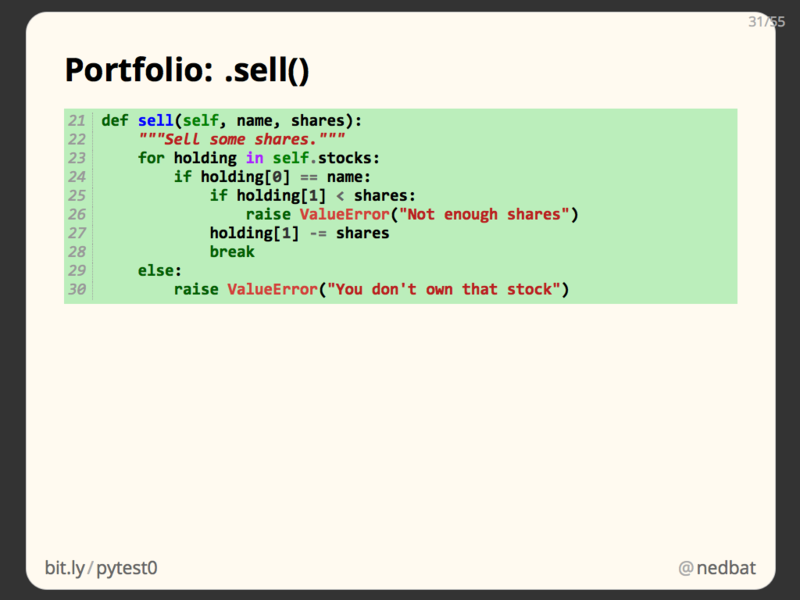 p = Portfolio() # Didn't I just do this? 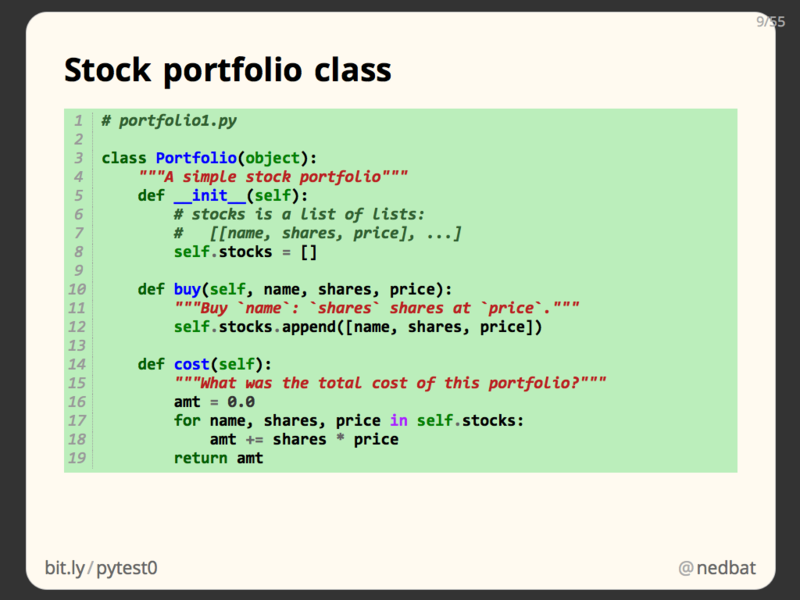 p = Portfolio() # What, again!?!? But now our tests are getting really repetitve. We’ve used the same four lines of code to create the same portfolio object three times. 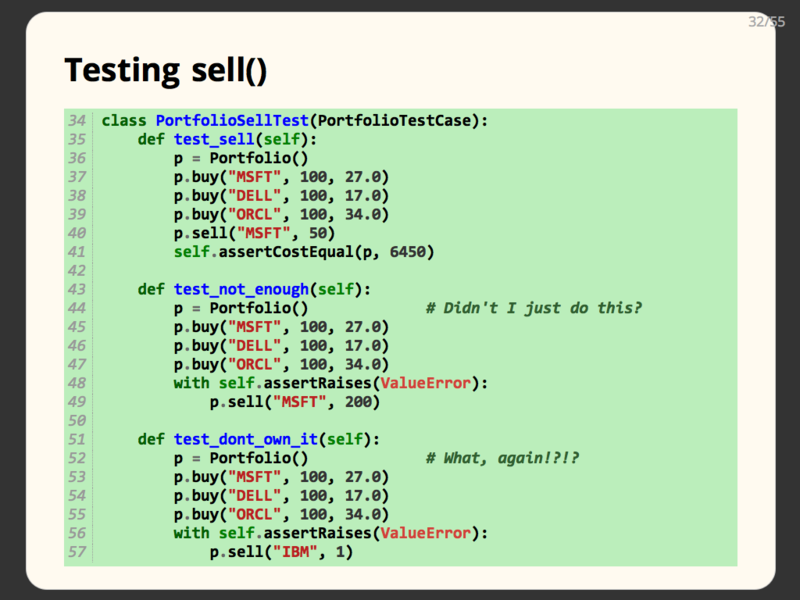 Here we have a .setup() method that creates a portfolio and stores it as self.p. Then the three test methods can simply use the self.p portfolio. Note the three test methods are much smaller, since they share the common setup code in .setUp(). 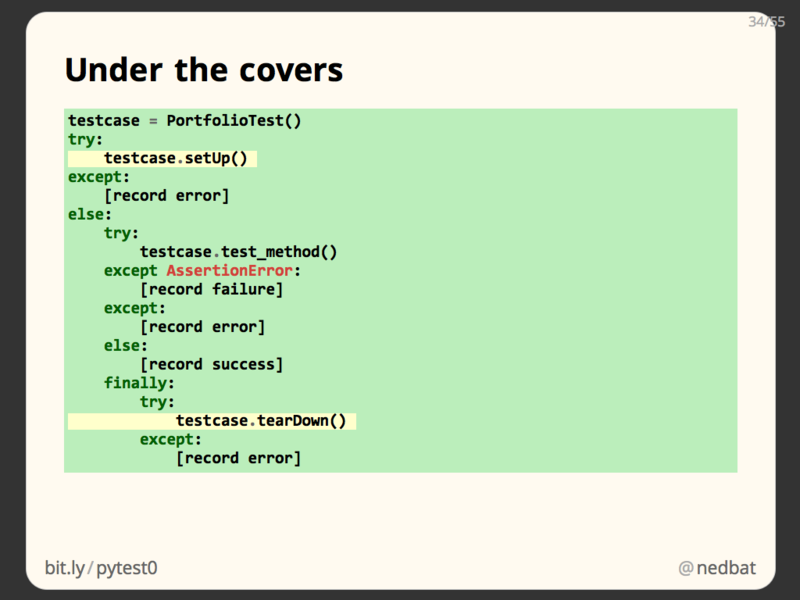 Naturally, there’s also a .tearDown() method that will be invoked when the test method is finished. tearDown can clean up after a test, for example if your setUp created records in a database, or files on disk. We don’t need one here. 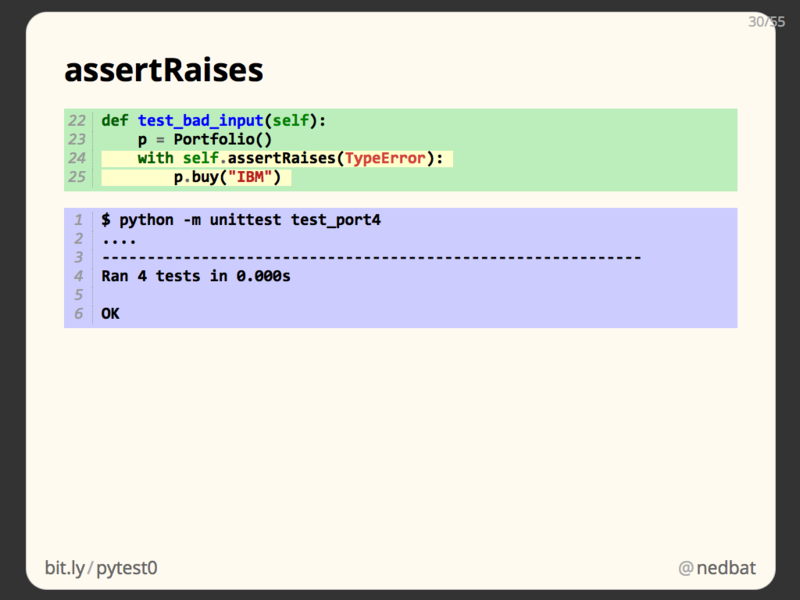 Here’s the detail on how unittest runs the setUp, test_method, and tearDown methods. A test case object is instantiated, and its .setUp() is run. 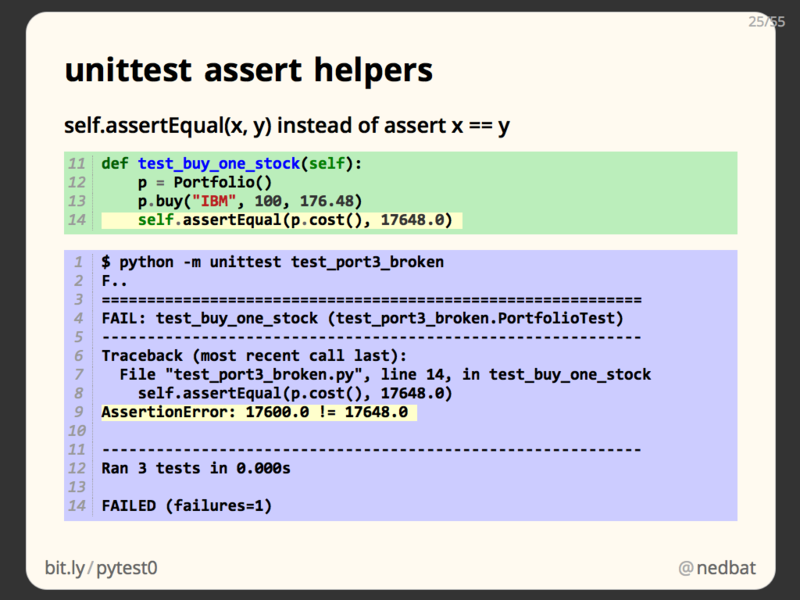 if it doesn’t raise an exception, then the .test_method() is run, noting its outcome. 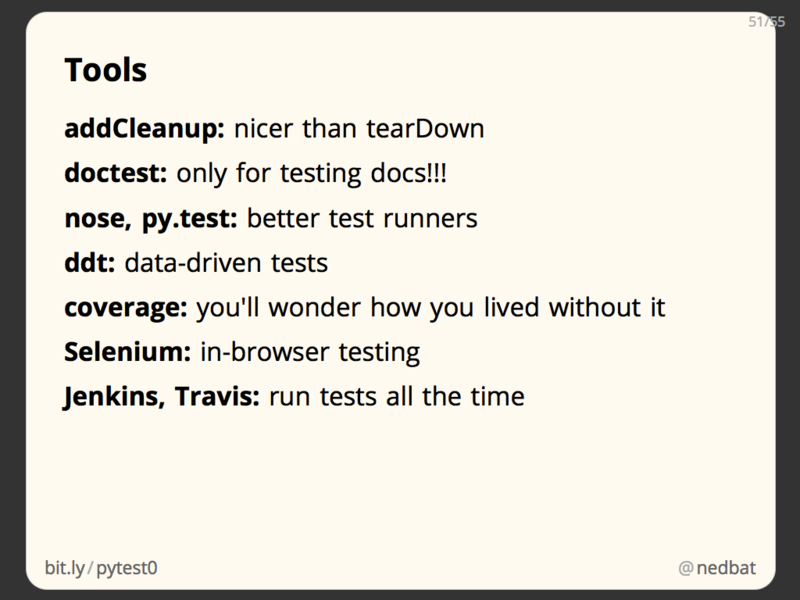 No matter what happens with the .test_method(), the tearDown() is run. 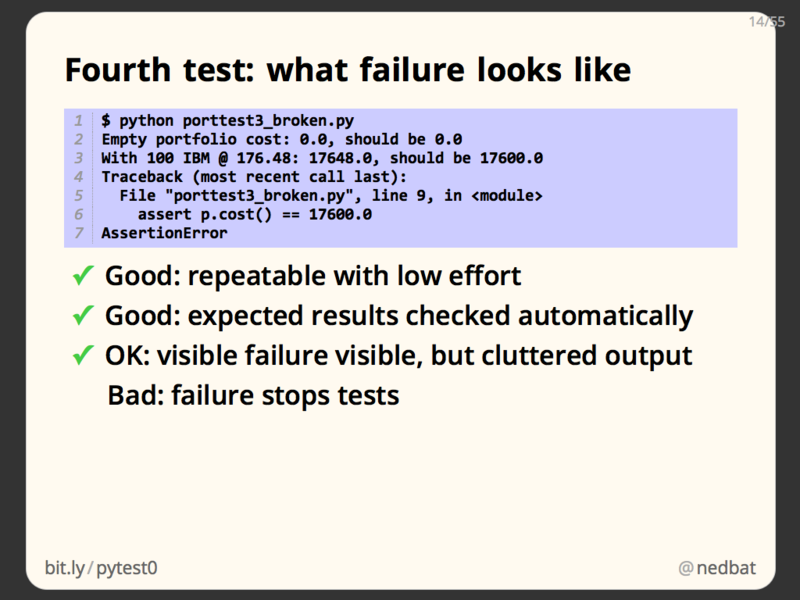 This is an important reason to put clean up code in a tearDown() method: it will be run even if your test fails. If you try to clean up after yourself at the end of your test method, then if the test fails, the clean up doesn’t happen, and you may pollute other tests. setUp and tearDown are important ways to write more concise tests, and more importantly, give you powerful tools for ensuring proper test isolation. If you find your setUp and tearDown methods getting elaborate, there are third party “fixture” libraries that can help automate the creation of test data and environments. You can see as we add more capability to our tests, they are becoming significant, even with the help of unittest. 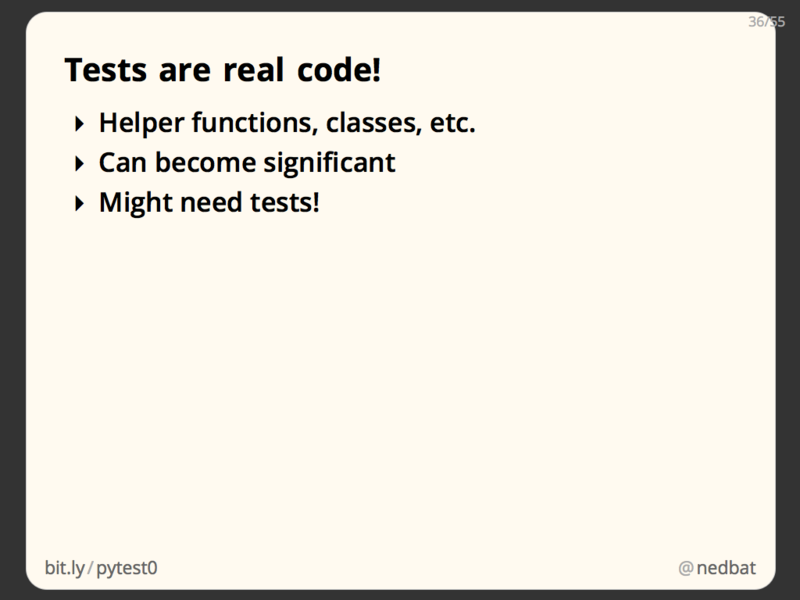 This is a key point to understand: writing tests is real engineering! If you approach your tests as boring paperwork to get done because everyone says you have to, you will be unhappy and you will have bad tests. You have to approach tests as valuable solutions to a real problem: how do you know if your code works? And as a valuable solution, you will put real effort into it, designing a strategy, building helpers, and so on. In a well-tested project, it isn’t unusual to have more lines of tests than you have lines of product code! It is definitely worthwhile to engineer those tests well. 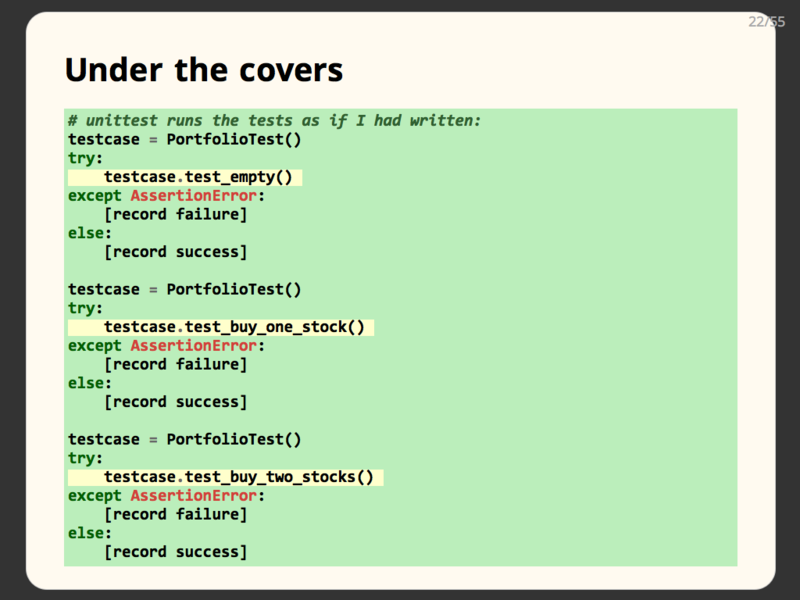 We’ve covered the basics of how to write tests. There’s more to it, but I want to skip ahead to a more advanced technique: mocking. Any real-sized program is built in layers and components. In the full system, each component uses a number of other components. 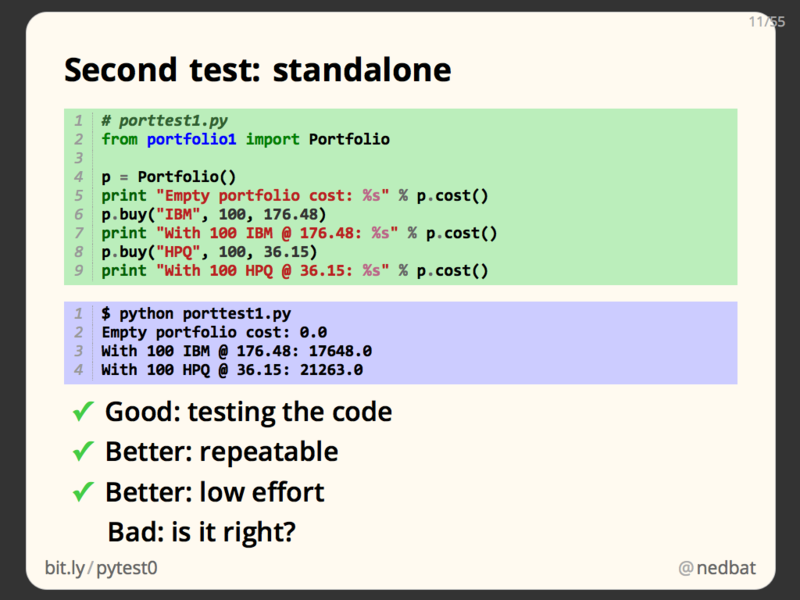 As we’ve discussed, the best tests focus on just one piece of code. How can you test a component in isolation from all of the components it depends on? 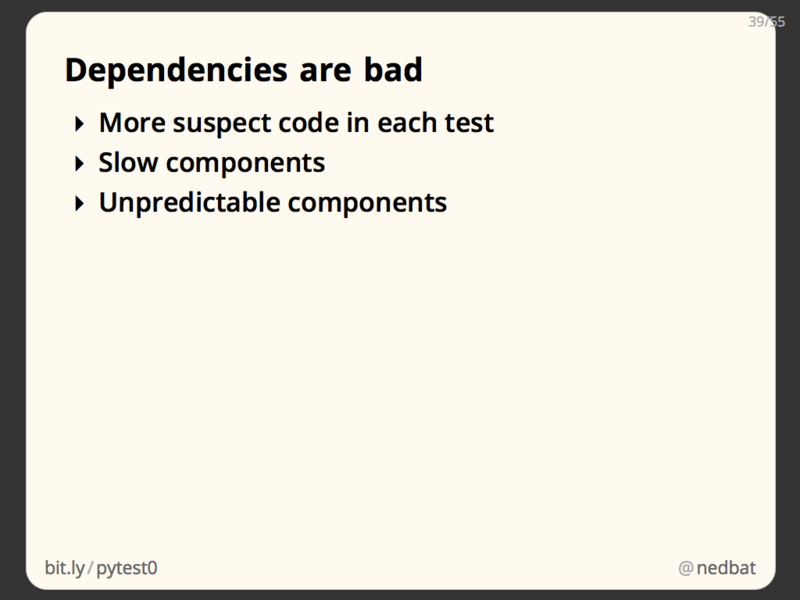 Dependencies among components are bad for testing. 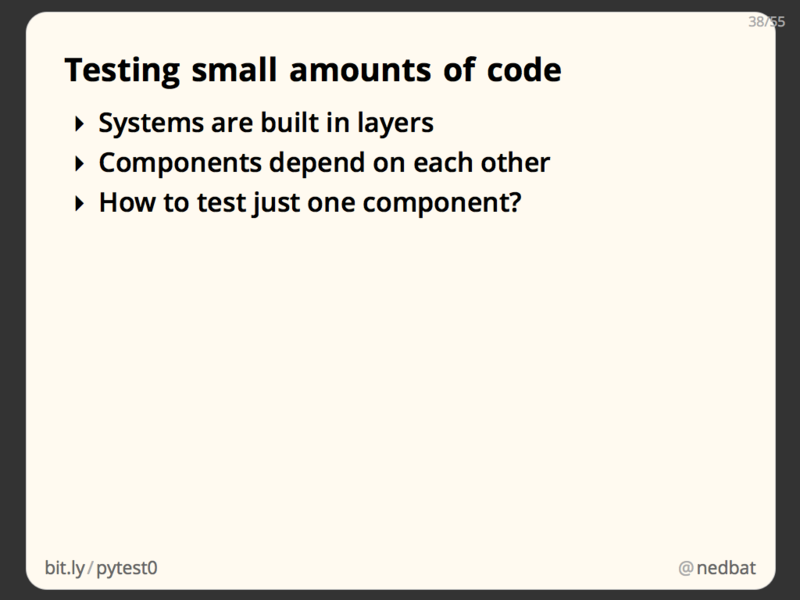 They mean that when you are testing one component, you are actually testing it and all the components it depends on. This is more code than you want to be thinking about when writing or debugging a test. Also, some components might be slow, which will make your tests slow, which makes it hard to write lots of tests that will be run frequently. 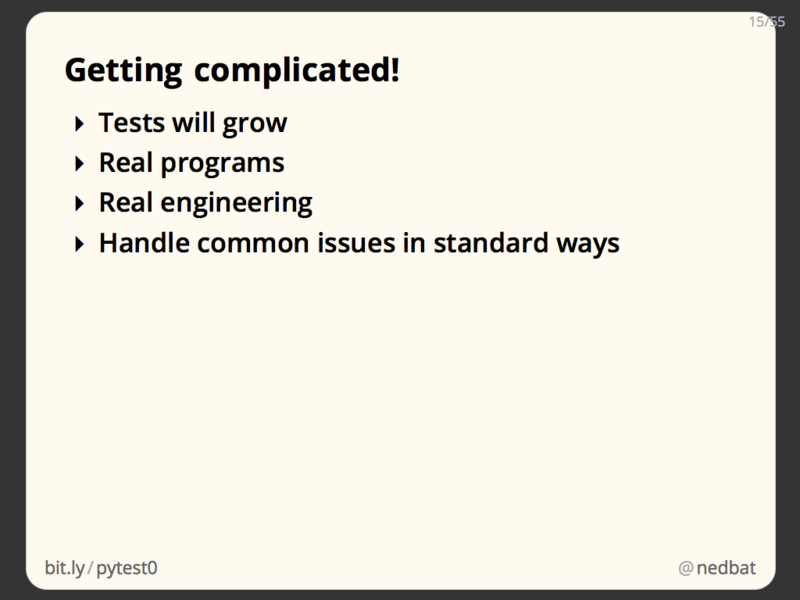 Lastly, some components are unpredictable, which makes it hard to write repeatable tests. The solutions to these problems are known as test doubles: code that can stand in for real code during testing, kind of like stunt doubles in movies. 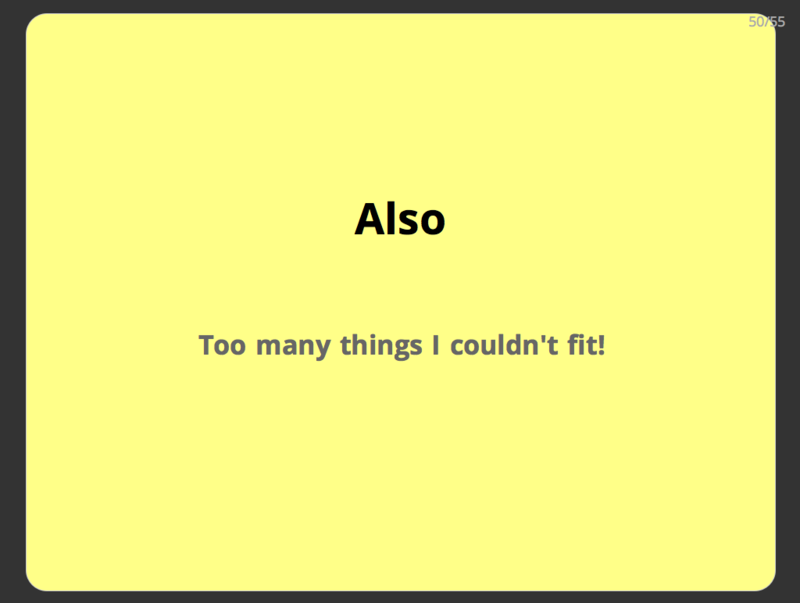 The idea is to replace certain dependencies with doubles. During testing, you test the primary component, and avoid invoking the complex, time-consuming, or unpredictable dependencies, because they have been replaced. The result is tests that focus in on the primary component without involving complicating dependencies. """Return a dict mapping names to current prices.""" """Return the current value of the portfolio.""" The new .value() method will get the current prices, and sum up the value of each stock holding to tell us the current value. Here we can try out our code manually, and see that current_prices() really does return us a dictionary of market prices, and .value() computes the value of the portfolio using those market prices. 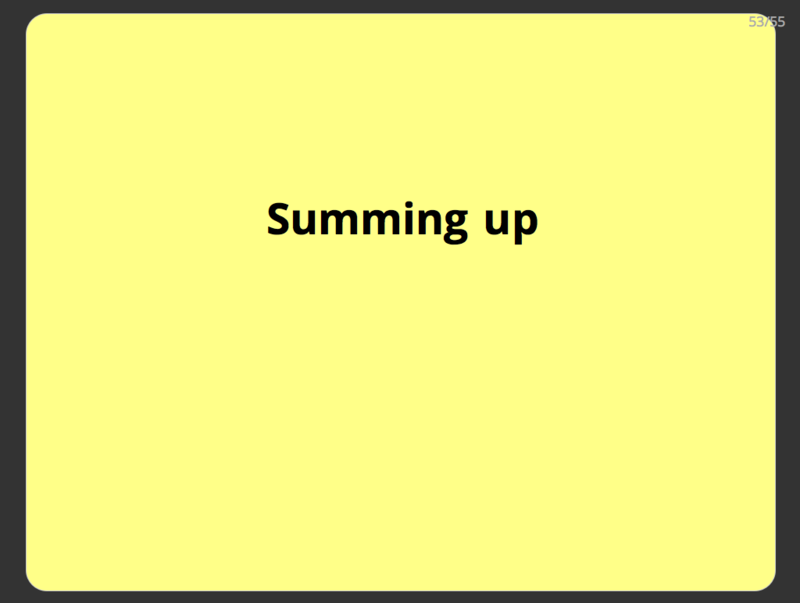 This simple example gives us all the problems of difficult dependencies in a nutshell. Our product code is great, but depends on an external web service run by a third party. It could be slow to contact, it could be unavailable. But even when it is working, it is impossible to predict what values it will return. The whole point of this function is to give us real-world data as of the current moment, so how can you write a test that proves it is working properly? You don’t know in advance what values it will produce. If we actually contact Yahoo as part of our testing, then we are testing whether Yahoo is working properly as well as our own code. We want to only test our own code. 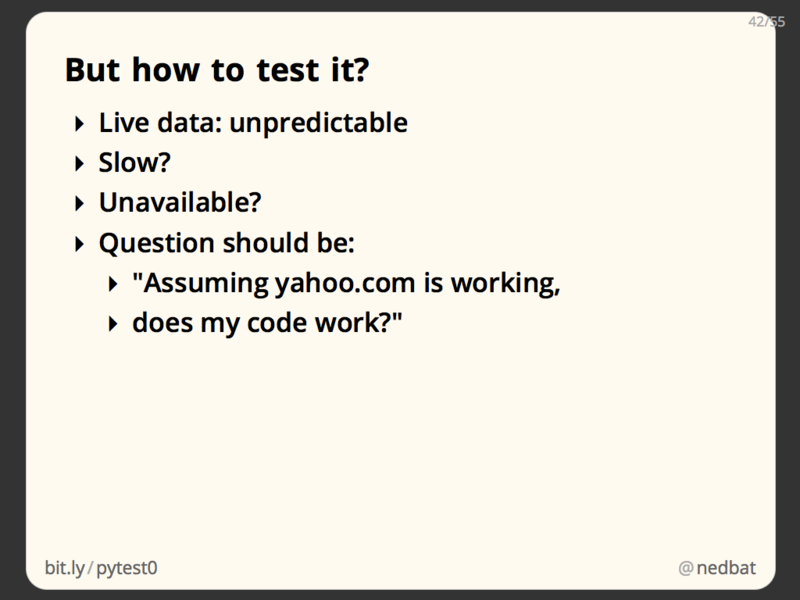 Our test should tell us, if Yahoo is working properly, will our code work properly? # Replace Portfolio.current_prices with a stub implementation. This is very simple, and neatly solves a number of our problems: the code no longer contacts Yahoo, so it is fast and reliable, and it always produces the same value, so we can predict what values our .value() method should return. 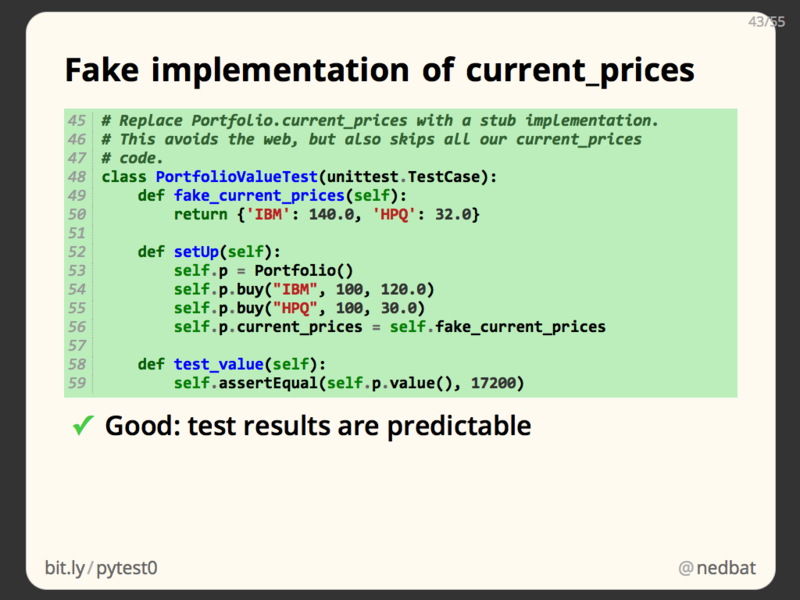 But we may have gone too far: none of our actual current_prices() method is tested now. Here I’ve used coverage.py to measure what product lines are executed during testing, and it shows us that lines 53 through 56 are not executed. Those are the body of the current_prices() method. That’s our code, and we need to test it somehow. We got isolation from Yahoo, but we removed some of our own code in the process. To test our code but still not use Yahoo, we can intercept the flow lower down. Our current_prices() method uses the urllib module to make the HTTP request to Yahoo. We can replace urllib to let our code run, but not make a real network request. # more complex for your own needs. # Save the real urllib, and install our fake. # Restore the real urllib. In our test’s setUp() method, we replace the urllib reference in our product code with our fake implementation. When the test method runs, our FakeUrlLib object will be invoked instead of the urllib module, it will return its canned response, and our code will process it just as if it had come from Yahoo. Notice that the product code uses a module with a function, and we are replacing it with an object with a method. That’s fine, Python’s dynamic nature means that it doesn’t matter what “urllib” is defined as, so long as it has a .urlopen attribute that is callable, the product code will be fine. This sort of manipulation is one place where Python really shines, since types and access protection don’t constrain what we can do to create the test environment we want. 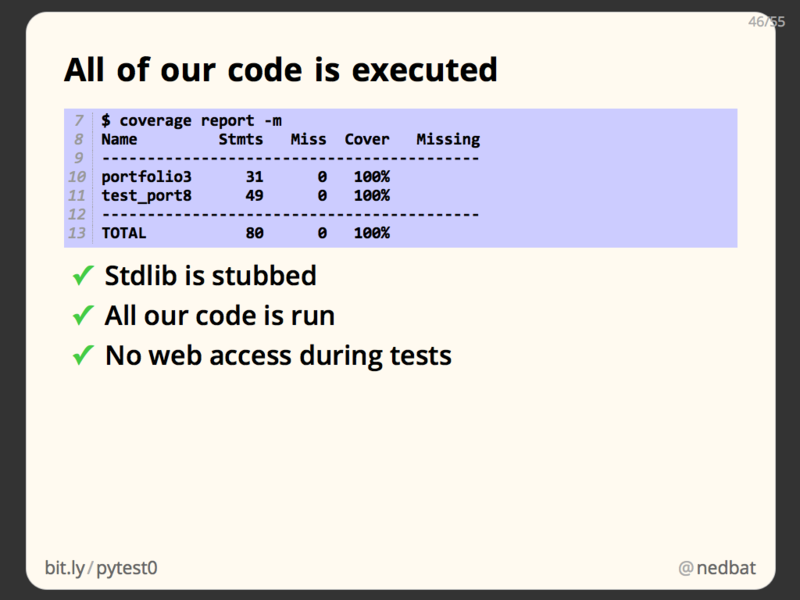 Now the coverage report shows that all of our code has been executed. By stubbing the standard library, we cut off the component dependencies at just the right point: where our code (current_prices) started calling someone else’s code (urllib.urlopen). 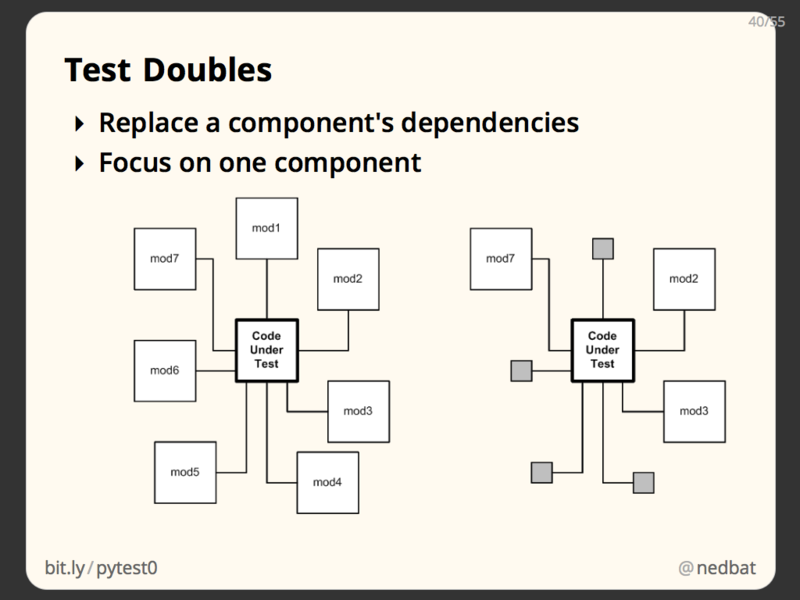 A more powerful way to create test doubles is with Mock objects. The mock library (third-party for 2.7, in the standard library for 3.3) provides the Mock class. This object will happily act like any object you please. You can set a return_value on it, and when called, it will return that value. Then you can ask what arguments it was called with. Mock objects can do other magic things, but these two behaviors give us what we need for now. # Create a mock urllib.urlopen. # We can ask the mock what its arguments were. In our test method, we use a context manager provided by mock: mock.patch will replace the given name with a mock object, and give us the mock object so we can manipulate it. 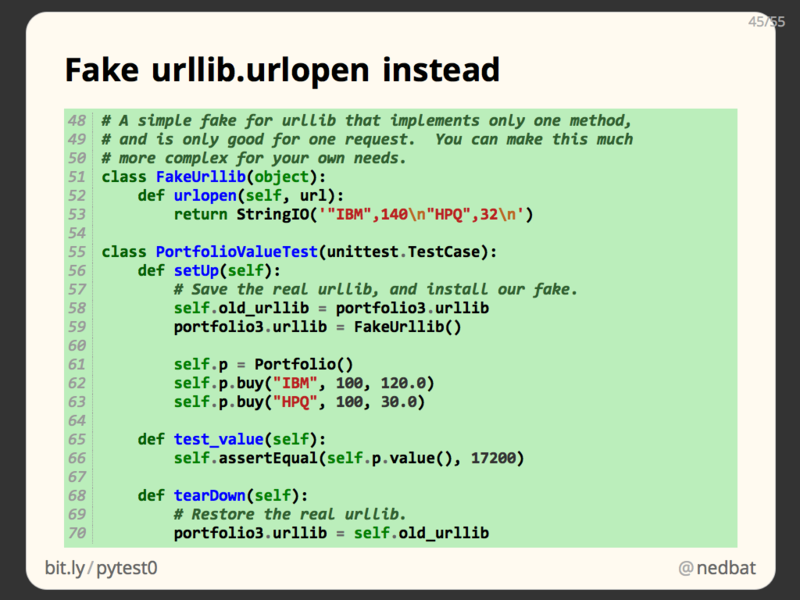 We mock out urllib.urlopen, and then set the value it should return. We use the same open file object that we did in the last example, which just mimics the bytes that Yahoo would return to us. Then we can run the product code, which will call current_prices, which will call urllib.urlopen, which is now our mock object. It will return our mocked return value, and produce the expected portfolio value. 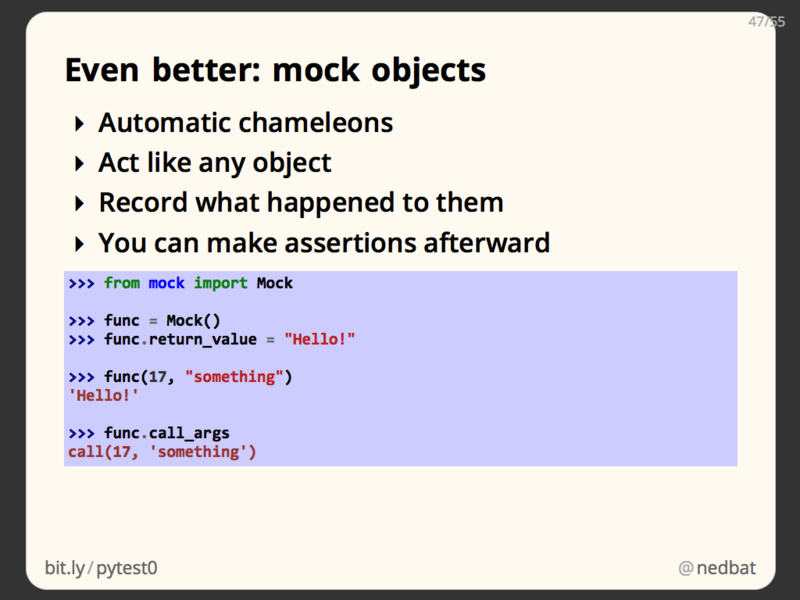 Mock objects also have a handy method on them called .assert_called_with() that let us make assertions about the arguments the mock object was passed. This gives us certainty that our code called the external component properly. When the with statement ends, the mock.patch context manager cleans up, restoring urllib.urlopen to it original value. The net result is a clean self-contained test double, with assertions about how it was called. Test doubles are a big topic all of their own. I wanted to give you a quick taste of what they are and what they can do. Using them will dramatically improve the isolation, and therefore the speed and usefulness of your tests. Notice though, that they also make our tests more fragile. I tested current_prices by mocking urllib.urlopen, which only works because I knew that current_prices called urlopen. If I later change the implementation of current_prices to access the URL differently, my test will break. 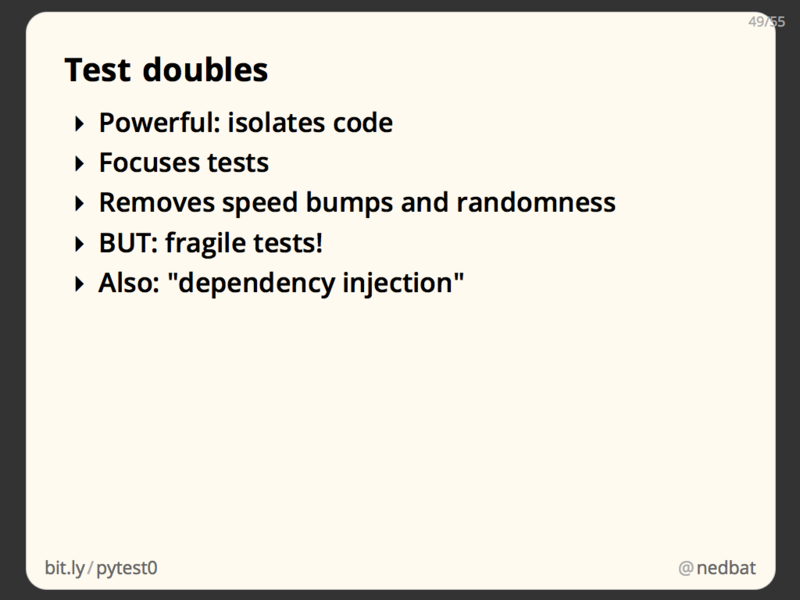 Finding the right way to use test doubles is a very tricky problem, involving tradeoffs between what code is tested, and how dependent on the implementation you want to be. Another test double technique is “dependency injection,” where your code is given explicit references to the components it relies on. This way, the dependencies are made more visible. This also makes them more visible to the non-test callers of the code, which you might not want. But it can also make the code more modular, since it has fewer implicit connections to other components. Again, this is a tradeoff, and you have to choose carefully how deeply to use the technique. Testing is a huge topic, there are many paths to take from here. addCleanup is a method on test cases. It lets you register clean up functions to be called when the test is done. This has the advantage that partially set up tests can be torn down, and you can register clean up functions in the body of tests if you like. 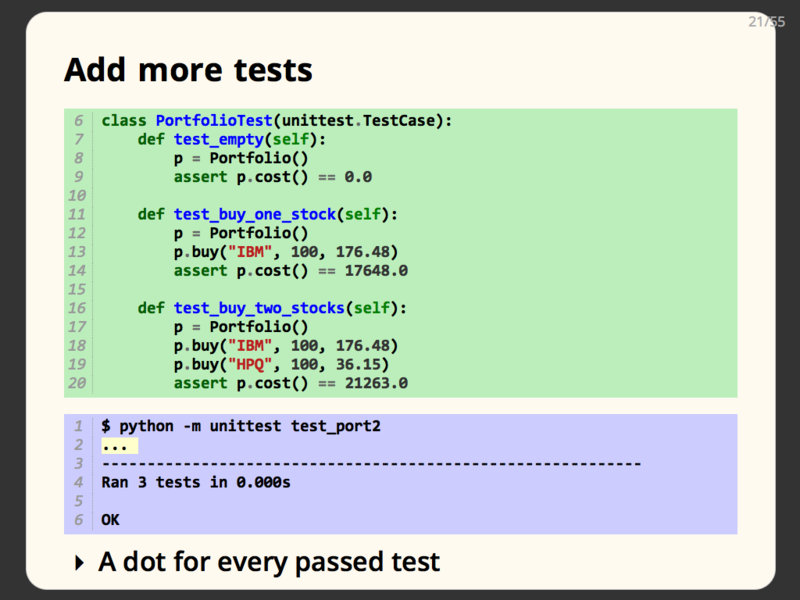 doctest is another module in the standard library for writing tests. It executes Python code embedded in docstrings. Some people love it, but most developers think it should only be used for testing code that naturally appears in docstrings, and not for anything else. nose and py.test are alternative test runners. They will run your unittest tests, but have a ton of extra features, and plugins. ddt is a package for writing data-driven tests. This lets you write one test method, then feed it a number of different data cases, and it will split out your test method into a number of methods, one for each data case. This lets each one succeed or fail independently. coverage.py runs your code, and measures which lines executed and which did not. 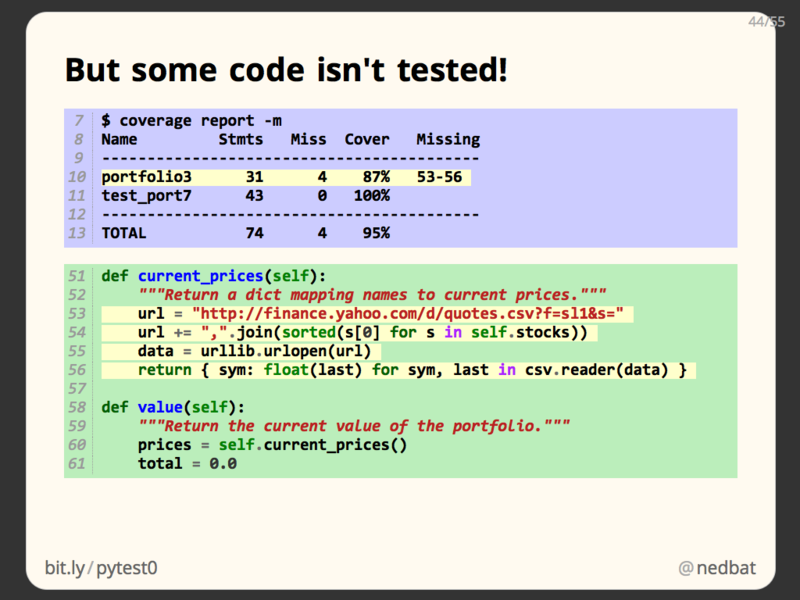 This is a way of testing your tests to see how much of your product code is covered by your tests. Jenkins and Travis are continuous-integration servers. They run your test suite automatically, for example, whenever you make a commit to your repo. Running your tests automatically on a server lets your tests results be shared among all collaborators, and historical results kept for tracking progress. Test-driven development (TDD) is a style of development where you write tests before you write your code. This isn’t so much to ensure that your code is tested as it is to give you a chance to think hard about how your code will be used before you write the code. Advocates of the style claim your code will be better designed as a result, and you have the tests as a side-benefit. Behavior-driven development (BDD) uses specialized languages such as Cucumber and Lettuce to write tests. These languages provide a higher level of description and focus on the external user-visible behavior of your product code. 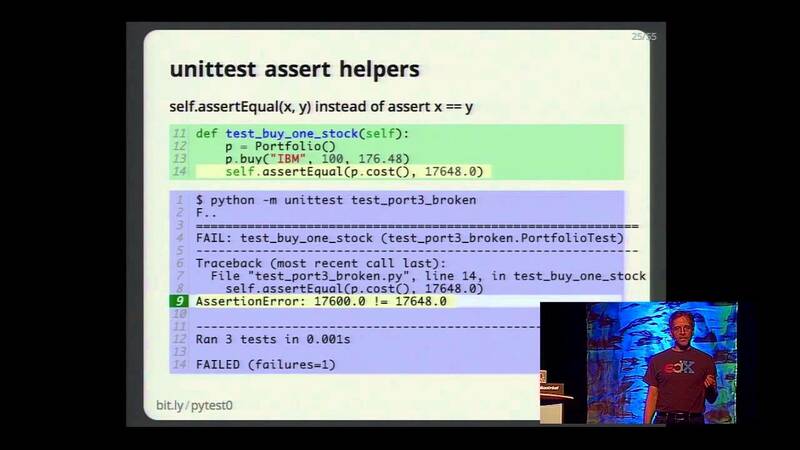 In this talk, I’ve focused on unit tests, which try to test as small a chunk of code as possible. Integration tests work on larger chunks, after components have been integrated together. The scale continues on to system tests (of the entire system), and acceptance tests (user-visible behavior). There is no crisp distinction between these categories, they fall on a spectrum of scale. Load testing is the process of generating synthetic traffic to a web site or other concurrent system to determine its behavior as the traffic load increases. Specialized tools can help generate the traffic and record response times as the load changes. There are plenty of other topics, I wish I had time and space to discuss them all! 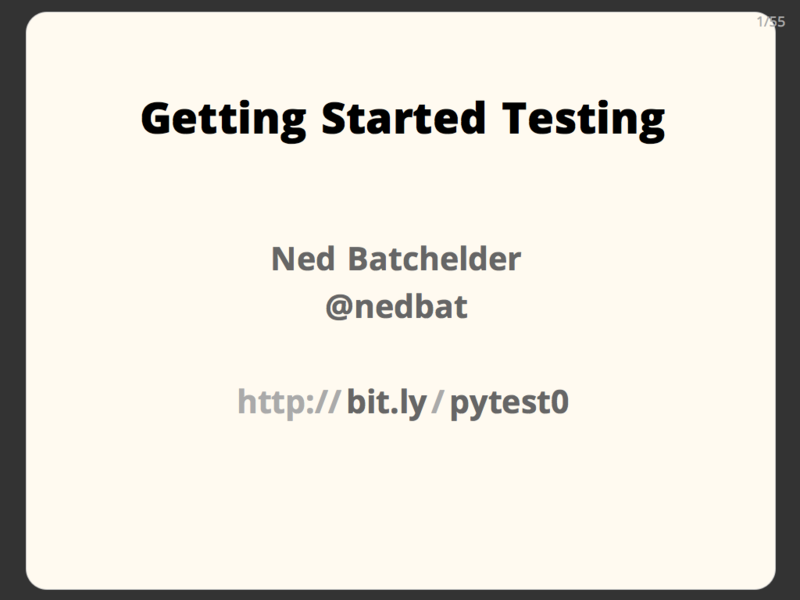 I hope this quick introduction has helped orient you in the world of testing. Testing is a complicated pursuit, because it is trying to solve a difficult problem: determining if your code works. If your code is anything interesting at all, then it is large and complex and involved, and determining how it behaves is a nearly impossible task. Writing tests is the process of crafting a program to do this impossible thing, so of course it is difficult. 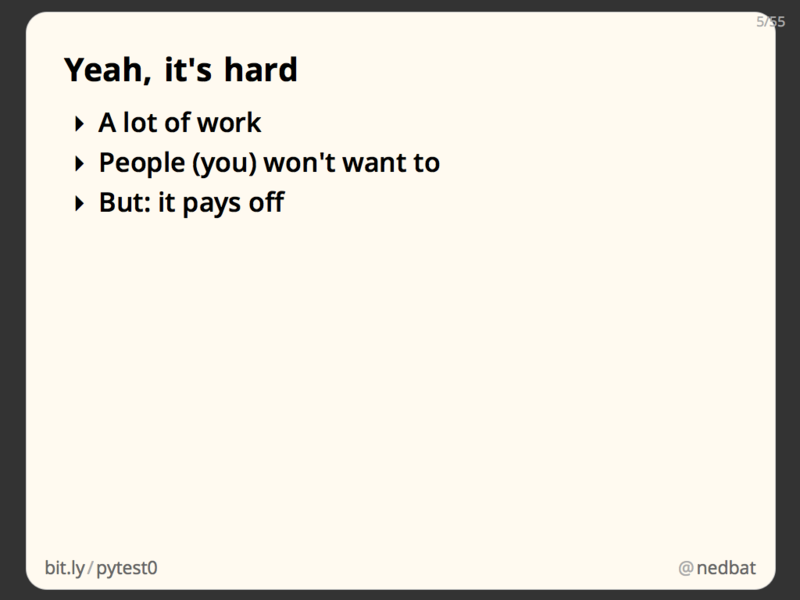 But it needs to be done: how else can you know that your code is working, and stays working as you change it? From a pure engineering standpoint, writing a good test suite can itself be rewarding, since it is a technical challenge to study and overcome. Having seen your 2010 talk, I was surprised to see that you're giving an example of patching rather than dependency injection. Do you have a criteria for evaluating the tradeoff between monkey patching and dependency injection in any given case? @Ryne: one of the challenges of a fixed timeslot talk is squeezing in everything you'd like to say. My goal with the mock section is to demonstrate the mechanics and tradeoffs of the technique. I've added some description of the dependency injection approach, but I don't have space to do a full example. * "Tests are the dental floss of development:" --> brilliant sentence! * "How often have you heard someone say, "I wrote a lot of tests, but it wasn't worth it, so I deleted them." --> I did that once. When I deleted a lot of .txt based doctests and decided that this wasn't the right approach, after all. 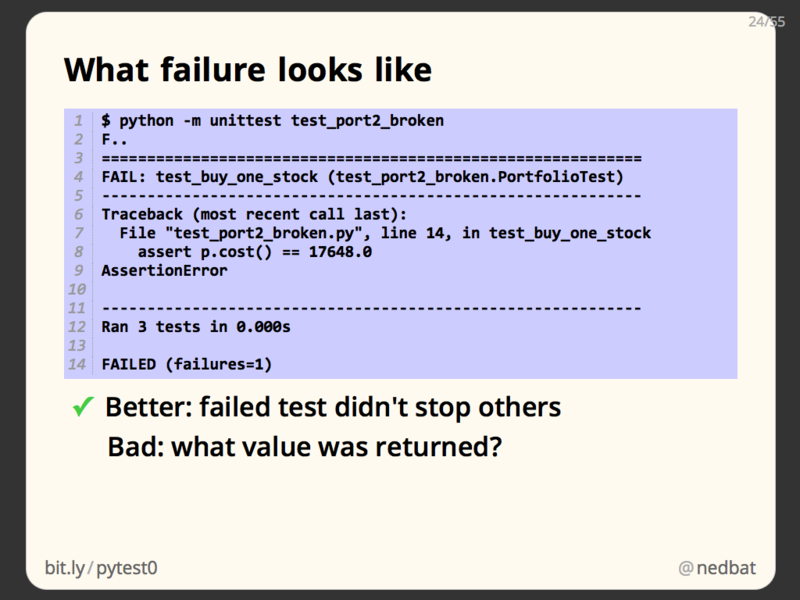 * What is your opinion on the various test modules in Python (unittest, nose, doctest, ...). Unittest is part of the standard library, but nose tests are easier to read and write (but they always pass with the -O flag).